Niagara Falls, NY - Artpark Director of Visual Arts and Family Programing Tanis Winslow heads up the re-installation of the painted parking lot titled "Niagara 1979." 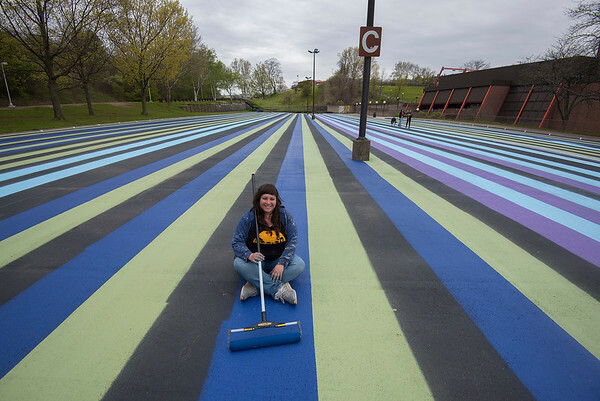 (Lewiston, NY)—Funding has been secured for the re-installation of the painted parking lot artwork titled “Niagara 1979” by Gene Davis. Artpark launched a Kickstarter campaign in February with a deadline of April 9 to reach the fundraising goal of $20,000 to make the project happen. The campaign was successful thanks to the support of 145 community backers who made donation pledges. Artpark gives special thanks to Michael Broderick and Robin Faulring of Orange Cat Coffee Co. in Lewiston for their dedication to the campaign, Sherwin & Williams for working with us to secure paint and materials, the Patricia H. and Richard E. Garman Art Conservation Department at Buffalo State College for their assistance with color matching, and to The Smithsonian American Art Museum (who holds the Gene Davis estate) for their permission to re-install the piece. The work will be in-stalled in it’s original location, parking lot C, which is adjacent to the Mainstage Theater, between the old trailer and the Outdoor Amphitheater Entrance. Installation will begin in the coming weeks after the lot has been resurfaced. Sixty, 2-foot wide by 364-foot long lines will be rolled in 9 different colors. The original artwork required 450 gallons of paint, 7 miles of masking tape, the help of 8 interns and an artist assistant (Clarence Wood). In the summer of 1979, the artwork of over 43,000 square feet was the world’s largest painting and thousands came out to experience it. Artpark invites everyone to watch the piece come together or to enjoy once it is complete. Stay tuned to Artpark’s social media sites for updates, photos, and videos of the project.